Serena Williams argues with chair umpire Carlos Ramos during a match against Naomi Osaka, of Japan, in the women's final of the U.S. Open tennis tournament, Saturday, Sept. 8, 2018, in New York. 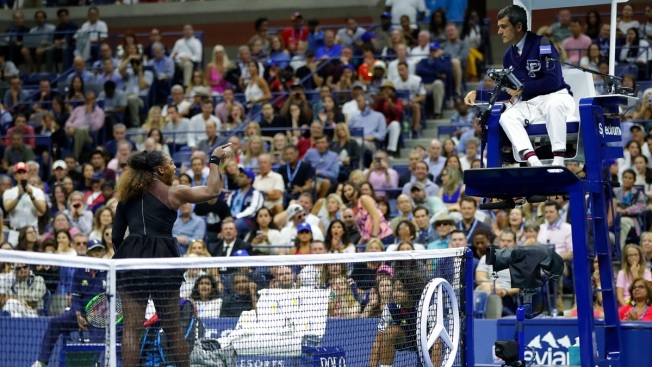 The events and the arguing and the booing that would make this a U.S. Open final unlike any other began when Serena Williams' coach made what she insisted was an innocent thumbs-up, but the chair umpire interpreted as a helpful signal. It was the second game of the second set Saturday, in a packed Arthur Ashe Stadium, and Williams' bid for a record-tying 24th Grand Slam title already was in real trouble because she was being outplayed by first-time major finalist Naomi Osaka. Chair umpire Carlos Ramos warned Williams for getting coaching during a match, which isn't allowed. She briefly disputed that ruling, saying cheating "is the one thing I've never done, ever." A few games later, Williams received another warning, this time for smashing her racket, and that second violation cost her a point, drawing more arguing. Eventually, Willams called Ramos "a thief," drawing a third violation — and costing her a game. With jeers bouncing off the arena's closed roof, both players — the champion, Osaka, and the runner-up, Williams — wiped away tears during a trophy ceremony that was awkward for everyone involved. "I felt, at one point, bad, because I'm crying and she's crying. You know, she just won. I'm not sure if they were happy tears or they were just sad tears, because of the moment. I felt like, 'Wow, this isn't how I felt when I won my first Grand Slam.' I was like, 'Wow, I definitely don't want her to feel like that,'" said Williams, who missed last year's U.S. Open because her daughter, Olympia, was born during the tournament. "Maybe it was the mom in me that was like, 'Listen, we've got to pull ourselves together here.'" This was the only the latest in a series of high-profile conflicts with match officials for Williams at Flushing Meadows. It all dates back to 2004, when an incorrect call during a quarterfinal loss to Jennifer Capriati was cited as the main reason for the introduction of replay technology in tennis. Then came Williams' infamous tirade after a foot fault in the 2009 semifinals against Kim Clijsters, and a to-do over a hindrance call in the 2011 final against Sam Stosur. "It's always something," Williams said. Osaka is just 20, 16 years younger than Williams — and grew up idolizing the American, even asking her to pose for a selfie together at a tournament just a handful of years ago. Their age difference was the second-widest gap between women's finalists at a Slam in the professional era. "I know that everyone was cheering for her," Osaka told the crowd, "and I'm sorry it had to end like this." What was most problematic for Williams on the scoreboard was that she was unable to keep up with a version of herself. Osaka, who happens to be coached by Williams' former hitting partner, hit more aces, 6-3. Osaka hit the match's fastest serve, 119 mph. She had fewer errors, 21-14. She saved five of six break points. And she covered the court better than Williams did. "She made a lot of shots," Williams said. "She was so focused." Indeed, that was what might have been most impressive. Osaka never let Williams' back-and-forth with Ramos distract her, never wavered from playing terrific tennis. The one time Osaka did get broken, to trail 3-1 in the second set, she broke back immediately, prompting Williams to smash her racket. That cost her a point, because of the earlier warning for coaching. Williams' coach, Patrick Mouratoglou, acknowledged afterward that he did try to signal Williams, but didn't think she had seen him — and added that he thinks every player gets coaching during matches. "I never had any warning in my career for coaching. Strange to do that in a Grand Slam final," Mouratoglou said. "Second, we all know that all the coaches coach at every match, all year long, from the first of January all the way to the 31st of December. We all know it." When Ramos called both players over to explain the game penalty, which put Osaka ahead 5-3, Williams began laughing, saying: "Are you kidding me?" Then she asked to speak to tournament referee Brian Earley, who walked onto the court along with a Grand Slam supervisor. Williams told them the whole episode "is not fair," and said: "This has happened to me too many times." "To lose a game for saying that is not fair," Williams said. "There's a lot of men out here that have said a lot of things and because they are men, that doesn't happen." Williams repeated her earlier sentiments during the postgame press conference. When asked whether she would have done things differently, Williams said she wouldn't. "I’ve seen other men call other umpires several things," she added. "I’m here fighting for women’s rights and for women’s equality. ... [I] feel like it was a sexist remark. ... The fact that I have to go through this is an example for the next person that has emotions and wants to express themselves and they want to be a strong woman. And they’re going to be allowed to do that because of today. Maybe it didn’t work out for me but it’s going to work out for the next person." Tennis legend Billie Jean King echoed Williams' feelings, saying there is a double standard in tennis that favors men. King tweeted "When a woman is emotional, she’s “hysterical” and she’s penalized for it. When a man does the same, he’s “outspoken” & and there are no repercussions." It was the second Grand Slam final defeat in a row for Williams, after Wimbledon in July. She's appeared in only seven tournaments this season since returning to the tour after having a baby during last year's U.S. Open. Williams was asked what she'll tell her daughter, Olympia, about what happened Saturday. "I'll tell her, first of all, if she sees it, that, you know, I stood up for what I believed in. I stood up for what was right," Williams replied. "Sometimes, things in life don't happen the way we want them, but always stay gracious and stay humble. I think that's the lesson we can all learn from this." AP Sports Writers Dan Gelston and Brian Mahoney contributed to this report.